The mothers of Erskineville were no different, with over 20 children featuring in advertising from the late 1890s to the late 1920s. Of these, what appears to be the most frequently published and long-running featured Hazel Harris, aged 2 years and 10 months, of 226 George Street Erskineville. Young Hazel first appeared in 1910 and continued to feature in newspapers around Australia until 1918. A breakfast of of Milk Arrowroots soaked in hot milk and sugar? No wonder young Hazel is pictured standing on her chair. 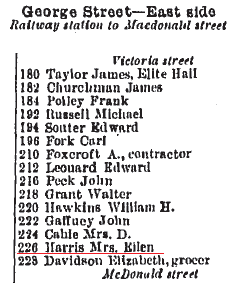 A check of the NSW Registry of Births Deaths and Marriages shows Hazel D Harris was born to John and Ellen E Harris, in the district of Lambton (Newcastle) in 1907. This entry was posted in 1910-1919, Advertising, Arnott's, George Street and tagged Advertising, Arnott's, Arnott's Milk Arrowroot, Biscuits, Erskineville, Erskineville History, Inner West. Bookmark the permalink.